Over Christmas I had a bout of man-flu and bravely put myself to bed for a few days. 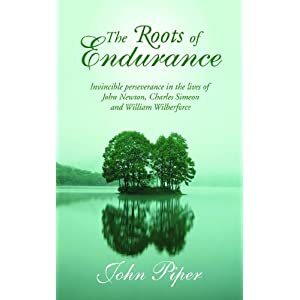 It turned out to be really good for my soul, since I was tucked up with a copy of John Piper’s heartwarming book “The Roots of Endurance: Invincible perseverance in the lives of John Newton, Charles Simeon and William Wilberforce”. Piper takes these three spiritual heroes from the 18th-19th century whose lives were at least loosely intertwined, three characters who were especially marked by perseverance: John Newton was a pastor in Olney and London for forty three years; Charles Simeon was minister at Holy Trinity church in Cambridge for fifty four years, during the first twelve of which he sustained incredible opposition from the wealthy and influential “pew holders” of the church but who ultimately could not be swerved from getting on with his job of teaching the whole counsel of God from the Bible; and William Wilberforce campaigned for the abolition of the slave trade almost from the age of 21, when he first became a Member of Parliament, to the year before his death, a total of almost forty six years during which the movement was defeated no less than eleven times in parliament. Piper’s aim is to get under their skin and examine exactly how they persevered in the face of such pressure, and what motivated their devoted service of the cause of Christ over all those years, and it should come as no surprise that ultimately it was their joy in a deep, personal relationship with Jesus himself. I’m not afraid to admit that one of the things I loved most about this book was its length: at only 166 pages in total it needn’t take you forever to read it. It basically just has one chapter for each man, plus an introduction and an epilogue, and each chapter is easily read in a single sitting. They’re obviously not the most in-depth biographies you’re ever going to read, but in many ways Piper isn’t so concerned with the bare facts about their lives as he is in the underlying theology and practice that made them tick, so there’s still probably something to be gained here even by those who are fairly familiar with the characters involved. It might also be worth mentioning that of course these three men were all English, and John Piper is both American and writing to a predominantly American audience, which might have been a recipe for frustration for English readers like myself, but in the end I hardly noticed it. I found reading the book to be really refreshing and encouraging in my Christian life. The essence of Piper’s analysis is that all three men knew exactly how much they’d been forgiven by Christ, and they reminded themselves of that fact daily. They didn’t shy away from shining the lamp of God’s word into every dark corner of their lives and naming sin as sin. Simeon in particular didn’t equate living by grace as being the same as “feeling good about yourself” – he looked rather to the model of passages like Ezekiel 36 where God says that in the day where He will wash his people’s sins away they will loathe themselves for the way they’ve treated God. Knowing how little they deserved produced a real gospel joy in the fact that God graciously accepted them as his children through the merits of Jesus’ life and death, which in turn motivated them to press on in faithful service. In summary: read this book. Especially if you find yourself flagging in the Christian life and start wondering how you’re ever going to keep going. God is a faithful God, and it turns out that it’s not really about us at all, but about what Christ has done and how we can enter into that.